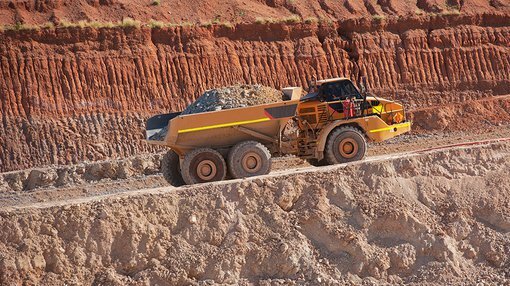 Only days after releasing high grade zinc and lead assay results from its Bonaparte project, Victory Mines (ASX: VIC) has released encouraging results from an exploration program at its Laverton project located in Western Australia. The company’s E 38/3075 tenement lies to the north of Laverton and only a short distance east of Leonora. Previous exploration conducted in 2013 within E38/2374 (in which E38/3075 is situated) defined several areas which were anomalous for gold, nickel and copper. Most of these anomalous regions were aligned with geological structures which were defined from a low level of circa 25 metres, and with the subject of a close spaced (50 metres) combined aerial radiometric and magnetic survey. A total of 1,239 samples were collected from within E38/2374, with samples taken every 50 metres on lines spaced 400 metres apart. VIC acquired E38/3075 early in 2017 and immediately planned an infill geochemical soil sampling programme to either infill the previously defined anomalous areas on a 200 x 25m pattern or to sample areas not previously tested. A total of 810 samples were designed to be collected, but unsuitable weather conditions affected access to one area, limiting the number of samples to 758. These were sent to ALS Laboratories where they were fine ground so that 95% of the sample was less than 75 micron. Various means of analysis were used to examine the samples, and the results were encouraging as they demonstrated that values in the top 5% were strongly anomalous, and values within the top 10% were viewed as moderately anomalous. Of course it is early stage in the development of this project, so investors should seek professional financial advice if considering this stock for their portfolio. The gold anomalies overlying the TMI (total magnetic intensity) magnetics can be seen below. The most northern anomaly is open along strike and across strike. The other 2 anomalous regions are up to 900 metres in length. The nickel anomalies are also draped over the TMI magnetics. 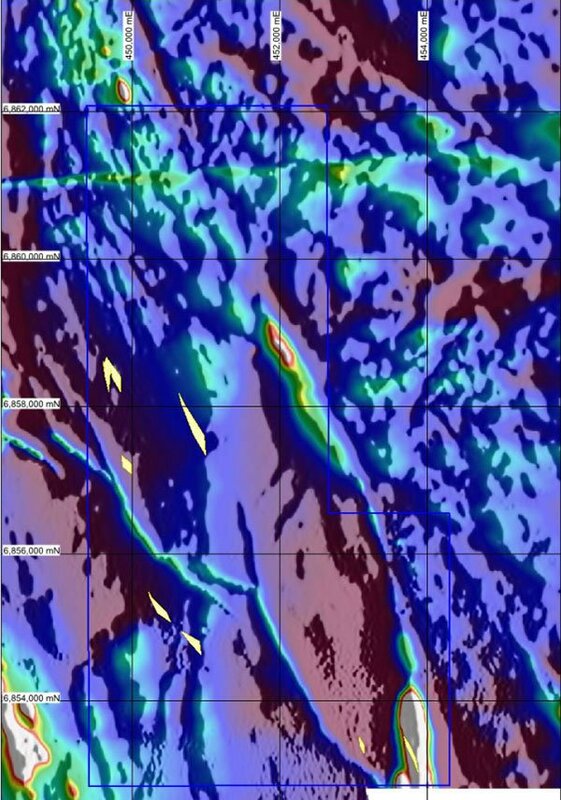 There is a large anomaly defined in the south of the tenement, which is approximately 1.25 kilometres in length and is situated along a prominent geological structure, while the nickel anomaly in the north is again coincident with the northerly extension of this structure. 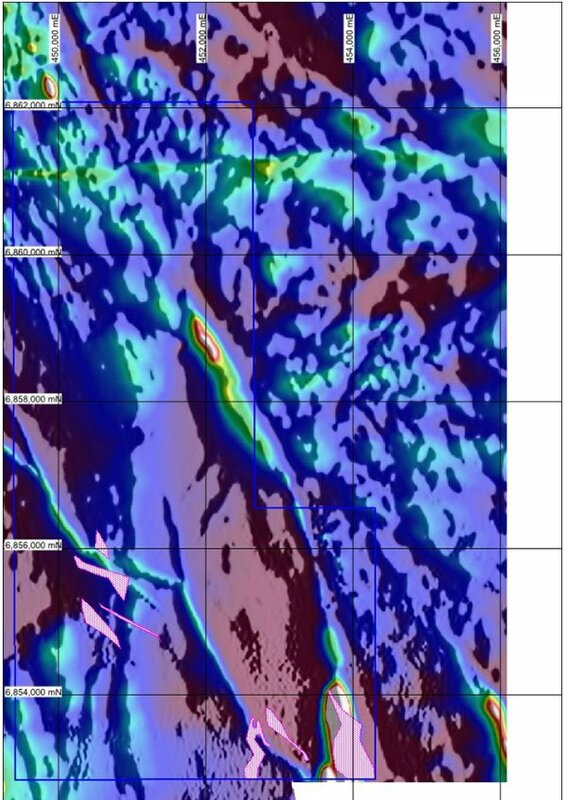 The copper anomalies are shown below, with the largest anomaly being over the same geological structure which contains the nickel anomaly. The other copper anomalous regions are again aligned with or close to, other geological structures. Management is preparing to conduct a geophysical ground electromagnetic survey which would potentially assist in the definition of suitable drill targets.